Etiwanda senior defensive back Treyjohn Butler is one of the area’s top recruits this season. He has eight offers, six of those from Pac-12 schools, and just returned from a trip to Cal. He says he benefited greatly from watching some highly touted teammates go through the process last year. Butler also has offers from Stanford, Washington, Arizona State, Washington State, Illinois and Northwestern. He has also taken unofficials to Stanford, USC and UCLA. He hasn’t quite decided which schools to which he will make official visits but expects two of those to be to Northwestern and Washington. He plans to major in chemical engineering so academics will factor into his final decision. He is also looking forward to his senior year and the Eagles making a run after settling for a fourth-place finish in the Baseline League a year ago. New coach Kevin Davis has brought a new energy. Etiwanda High School linebacker Khaylan Thomas has made a verbal commitment to Arizona State. The 6-foot, 217-pound standout announced the decision via Twitter tonight. He had 15 or so offers. He had made “unofficial” trips to Arizona, Arizona State, UCLA and USC with the unofficial to Arizona State coming over the summer. He had a visit planned for Oregon State and hasn’t decided whether or not he’ll make that one. Thomas, an All-Inland Valley selection last year as a junior, has 43 total tackles, five of those for a loss, with one interception and a fumble recovery so far this season for the Eagles. Thomas plans to major in sports business. Eitwanda High School football standout Michael Neal has made a verbal commitment to University of Washington. The 6-foot-4, 200-pound wide receiver put up modest statistics last year with just nine catches for 127 yards but that was because the Eagles were a run-first team. Because of that, Neal considered himself one of those “under the radar” players. He has not visited the school yet. 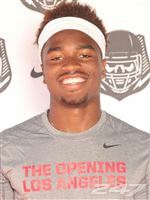 He plans to take an “unofficial” visit there in August and than go on an “official” visit sometime during the football season. Among the other schools showing some interest were Arizona, Arizona State and San Diego State although those schools had not formally offered. Etiwanda High School offensive lineman Zach Berdnik has committed to Division II University of Central Missouri, according to Eagles coach Brandon Rohrer. Berdnik, a 6-foot-5, 290-pounder was a two-year starter at tackle. He is a relative newcomer to the sport, having played for the first time as a junior. Rohrer said his player also had planned trips to Arkansas State and Wyoming but those schools both had coaching changes so Berdnik didn’t end up making the visits. Berdnik will join a Mules program that went 6-5 last season. The school is located in Warrensburg, Mo. and has an enrollment of 12,000. The Mules compete in the Mid-America Intercollegiate Athletics Association.